For years, the Superberries team has been hearing how great our family of products is and how they have positively impacted the lives of those who choose them. 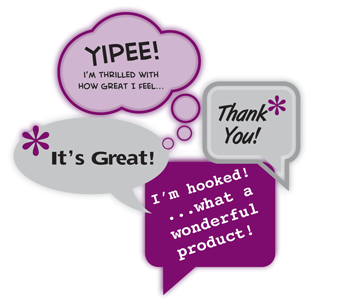 We would like to share those testimonials with you. Read what Berry Believer’s have to say about Superberries, or if you would like to submit a testimonial and share your comments with other’s who could benefit, email us at contactus@superberries.com. Amy, "I am a mother of two young children. I have tried to make it a point to..."
I am a mother of two young children. I have tried to make it a point to encourage them to eat healthy and be aware of what kind of food choices they are making. This year, as a family, we made it a goal to try to eat as healthy as possible and cut out as much of the junk food as possible. As a part of our efforts, I started to incorporate the aroniaberry gummy chews for the kids as a supplement. I would give them a small pack of the aroniaberry chews instead of a pack of the fruit chews we buy on the mass market. They have tried many of the fruit chew vitamins that are on the market, and just have never seemed to like any of them. We happened upon the Superberries fruit chews, and they LOVE them! They would eat as many of them as they could get their hands on if I didn't control them!! A serving size is 11 fruit chews. I can honestly tell you, my children have been eating these since October 2010, and we haven't missed a single day of school due to illness and I cannot help but credit part of that to the fruit chews. I've read numerous testimonials stating that aroniaberries have helped aid many people with health issues, and I can see a difference in my children from them as well. I would highly recommend to our parents getting these fruit chews for their children! My kids love them and I love seeing them choose a healthy fruit snack that is aiding their immune systems!!!! Shelly, "My 80 year old Mother-in-law has problems with her eyes..."
My 80 year old Mother-in-law has problems with her eyes. She is 99% blind and was told there is nothing more the doctors can do to help her. I told her she had to try Superberries, we just started selling it at our nutrition store. She has drinking Superberries since July 15, 2010 and she called me the other day and said she could see the numbers on her alarm clock for the first time in a year and half. She was so happy she was crying. I think they really are a miracle! At a recent visit to her eye surgeon, her pressure has stabilized and it has not been stable for more than 10 years. I am so excited to have this product in my nutritional store to help my family and friends. Desirae, "When I first got married, I had a number of bladder health issues..."
When I first got married, I had a number of bladder health issues, so many that they were having a negative affect on my body. At the time we didn't have insurance either so it was becoming a costly inconvenience for us. My husband found out about aroniaberry and I was desperate to try anything! I started using the aroniaberry juice concentrate in June of 2009 and I haven't had a bladder health issue since!! I am very relieved to have found this product and that it truly works! I have recommended aroniaberry to several of my friends who have also loved this product! Thanks aroniaberry for helping me and making my life more enjoyable!! William, "My daughter is a Doctor of Oriental Medicine in New Mexico..."
My daughter is a Doctor of Oriental Medicine in New Mexico. When she told me the remarkable results she was seeing with her patients I started eating Aroniaberries. I am involved in football camp and with Superberries I can scrimmage for 3 1/2 hours against 340lb linebackers in full pads when it is 100 degrees outside. Ryan, "I have had pain in my ankles, primarily my left ankle for about 10 years..."
I have had pain in my ankles, primarily my left ankle for about 10 years. I went to a doctor about 8 years ago who told me I had long term joint problems and there was nothing that can be done. Since it was getting worse, about 2 years ago I went to another doctor, who had an MRI performed on my left ankle which showed that I had a bone bruise which hadn't healed, with joint problems on top of the bruise. Surgery could help but it would be risky. Two people where I work eat aronia berries regularly for different reasons. They convinced me that I should try them to see if they would help my ankles. It's only been a month since I started eating them, but my ankles started feeling better within a few days. Before I couldn't walk more than a couple blocks. Now I'm starting to think I might be able to try jogging again. They are less swollen as well. I saw my MRI results. It's hard to believe that these berries can actually be healing the damage that I saw, but that is exactly what I feel is happening. Shirli, "My cholesterol went down..."
My cholesterol went down after eating aroniaberries for 30 days. Claire, "I’ve been eating 45 aroniaberries a day for a year now..."
I’ve been eating 45 aroniaberries a day for a year now. My cholesterol has dropped. And my blood is flowing more freely in my arteries. Diane, "During my second occurrence with breast cancer..."
During my second occurrence with breast cancer, using Superberries products helped improve my overall health during chemotherapy.